Your Civil War ancestor may have served from a neighboring state to help that state meet its quota. Don’t limit your Civil War service record searches to the state in which your person lived. They may have served after crossing the state line. And never assume that there’s only one guy with your somewhat unusual name . 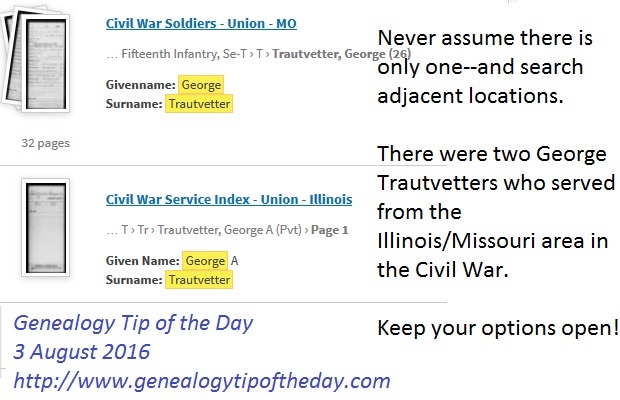 I originally thought these two George Trautvetters were the same person who served in an Illinois and a Missouri unit. As it turns out, they were likely first cousins. 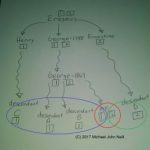 How do you know it is the person you are looking for? Especially with a more common name? Is this also true of the American Revolution? I have ancestors who were born and grew up in VA, but served from PA. Many Kentucky confederates had to go to neighboring states to enlist as we did not join the Confederacy. Just over the line in Montgomery County, TN at Camp Boone, soldiers from Logan and Todd Counties enlisted and trained. My Indiana (Washington Marion Crawford) ancestor served for the state of New York (Company H, 2nd Regiment, New York Cavalry). I still haven’t figured out the how/why. His pension record identifies the same family members as other family records so I don’t have doubts about having the correct person. I had a great uncle who when mustered out of an Illinois cavalry unit toward the end of the war and then joined an Arkansas cavalry (with a promotion) until several months after the war ended.